Robert Dennard invented one of the most significant advances in computer technology of modern time—dynamic random access memory, (or DRAM, better known simply as RAM). Robert H. Dennard was born in Terrell, Texas, USA, in 1932. In 1950 he earned a band scholarship to attend Southern Methodist University in Dallas, where he received his B.S. and M.S. degrees in Electrical Engineering in 1954 and 1956, respectively, then he went for a Ph.D. from Carnegie Institute of Technology in Pittsburgh, Pennsylvania, received in 1958. In the same 1958 Dennard became a Staff Engineer in the Research Division of IBM, where he planned to spend a couple of years at most learning the ropes. Forty-two years later, Robert Dennard remains one of IBM's most honored engineers. In IBM Dennard was a head of a small research team, working on field-effect transistors (FETs) and integrated circuits, using the then standard six-transistor memory cell for each bit of data. In 1966, Dennard had the idea that binary information could be stored as a positive or negative charge on a capacitor. The only hitch was that capacitors leak the charge off in milliseconds, so after several months of experimenting Dennard devised a configuration where a single field-effect transistor could read the charge and put it back thousands of times per second. A single transistor would then be responsible for each bit of information, thus reducing the size of the whole cell dramatically. The constant refreshing of the charge on each capacitor is why Dennard's chip is referred to as "dynamic" RAM. At that time, RAM was a known and used concept: memory reserved for writing to and reading from in a temporary fashion, to be erased every time the computer is turned off. However, in the mid-1960s RAM required an elaborate system of wires and magnets that was bulky and power hungry, negating in practice RAM's theoretical efficiency. Dennard's revolutionary achievement was to reduce RAM to a memory cell with only a single transistor. The ultimate effect of Dennard's invention was that a single chip can hold a billion or more RAM cells in modern computers. Dennard was granted a patent for his Field-effect Transistor Memory in June, 1968 (see the US patent 3387286). 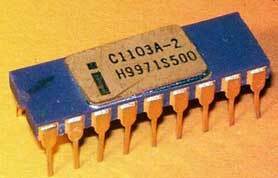 In 1970, the newly formed Intel company publicly released the 1103 (see the nearby image), the first DRAM chip (1K bit PMOS dynamic RAM ICs), and by 1972 it was the best selling semiconductor memory chip in the world, defeating magnetic core type memory. The first commercially available computer using the 1103 was the HP 9800 series. By the mid-1970s, Dennard's RAM was standard in virtually all computers. When personal computers became thinkable, RAM system allowed them to perform complex operations and still fit on a desktop. Meanwhile, Robert Dennard, since 1979 a Fellow of IBM's T. J. Watson Research Center, has continued his career of invention, in refinements to RAM, specialized FETs, and low-voltage, high-performance operation of circuits. 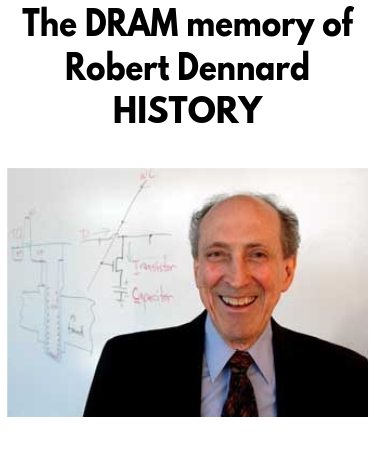 Over the years, Dennard has earned 37 patents, and numerous honors for his work, including the National Medal of Technology (1988), the Harvey Prize from Technion (Israel Institute of Technology) (1990), the IEEE Edison Medal (2001), the Lemelson-MIT Lifetime Achievement Award (2005) and 2007 Benjamin Franklin Medal in Electrical Engineering. He was also inducted into the National Inventors Hall of Fame in 1997. Dennard is also a coauthor of the "scaling theory," an analytical framework for studying the special conditions of engineering microchips in ever more microscopic dimensions.